K.E.F.I. 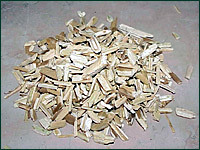 Spa with its separating process also produces core, that is all the woody part inside the kenaf stem, highly appreciated for its extraordinary capacity to absorb moisture, water and liquids up to 4 times its specific weight (common wood chips and shavings for instance absorb only up to 2.5 times and are therefore, for the same cost, less appealing for the above-mentioned uses!). Core is therefore a valid ecosustainable vegetable biomass to absorb, drain and neutralize liquids, sewage and chemical and/or oil compounds and it is offered in various sizes and packages (in polyethylene bales of approximately 15 kg, or in blocks of 2 kg up to packaging in big bags of 200 kg) so as to satisfy every need.